You can make wreaths to fit any season for your home. One of my favorites is for spring. After the long winter months it is nice to add some cheer. Do you get tired of the gloomy days of winter? I know I do and what better way then to bring spring indoors. 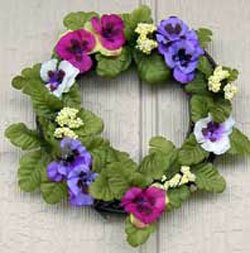 A Pansy wreath is very easy to make and adds a little sunshine to your home. You can brighten your home with any kind of spring flowers that add a bunch of color. They are very easy to make and you probably have all the material that you would need right at home. Just remember that you don't have to make it with pansies. You can use any spring flowers. Silk pansies with leaves or flowers of your choice. You can use any size that you want for this project. Either make your own grapevine or you can purchase one at your local craft store. Arrange the leaves on first. After you have them arranged use your hot glue gun to attach them. If you were going to put a ribbon on, now would be the best time before you put your flowers on. It is best to attach the bow with wire. It will stay on a lot better with wire than with glue. Then put your flowers on in the design that you like and hot glue them on. You can move them around until you have the look you want. If your wreath doesn’t have a hanger make one with wire and attach it to the back.